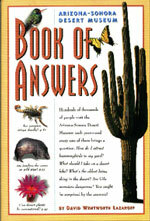 Arizona-Sonora Desert Museum Book of Answers is currently out of print. What exactly is a desert? How can I attract hummingbirds? Are cactus spines poisonous? Is a javelina a pig? This book provides detailed answers to 42 questions that the staff at the Desert Museum are most often asked. Supplemented with nearly 100 illustrations, this 200-page book is broken down into three sections: getting to know the desert, the desert as one's backyard, and enjoying the desert. Seven useful appendixes cover a range of topics including hummingbird gardening, venomous bites and stings, climate, and additional sources of information about desert life. A fun way to learn how wild and fascinating our deserts really are! How old do desert plants get? What should I do about an injured, sick, or orphaned animal in my yard? What might I bring on a hike to help me enjoy the desert? How did Indians live in the Sonoran Desert? How can I attract desert wildlife to my yard? with rattlesnakes while hiking in the desert? How should I transplant cacti? If I find a desert tortoise in the wild, can I take it home as a pet? "An excellent introduction to desert ecology . . . A very useful, and inexpensive, book." "This valuable book should find a place on every desert dweller's shelf."